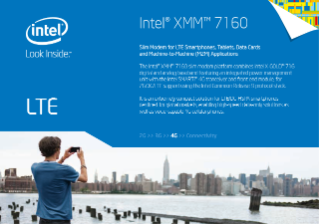 The Intel® XMM™ 7160 slim modem platform combines Intel® X-GOLD™ 716 digital and analog baseband featuring an integrated power management unit with the Intel® SMARTi™ 4G transceiver for 2G/3G/LTE and the Intel® Comneon release 9 protocol stack. It is an extremely compact solution for LTE/DC-HSPA smartphones destined for... global markets, enabling high-speed data-only solutions as well as voice-capable 4G cellular phones. LTE enables download speeds of up to 100 Mbps, making it significantly easier for users to share or process larger files such as videos. Keeping pace with you, Intel smartphones enable multitasking, fast web surfing, and 8MP photos. See how Intel® technologies help transform cable and home networks to meet greater bandwidth demands.